Kerys Harrop scored with a late header to ensure Birmingham City marked Women's Super League One survival with victory at Notts County. With Bristol Academy relegated after losing 6-1 at Manchester City earlier on Sunday, Blues were already safe. 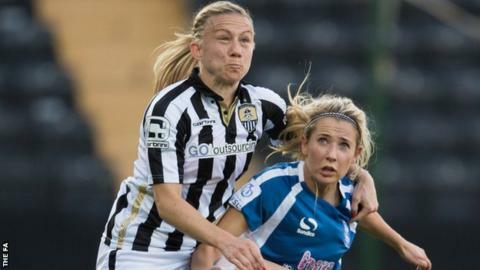 Alex Greenwood and Jess Clarke both hit the woodwork for Notts, while Karen Carney struck the bar with a free-kick and Harop put the rebound wide. Harrop won it two minutes from time, nodding home a Jo Potter corner. England defender Greenwood, who scored twice to help Notts into the Continental Cup semi-final in her last appearance, made the most of being pushed into midfield and proved to be a constant menace in her free attacking role. She angled an effort off the underside of the bar as Notts made a bright start to their final home game of the season. Potter escaped with just a caution after appearing to push Leanne Crichton in the face before Clarke saw a low shot from the edge of the area crash off the foot of the post. At the other end, Harrop was quickest to react after Carney's free-kick hit the crossbar, but the defender scooped her effort off target. She made amends with her late header, punishing Notts for their prolificacy. Notts County: Telford, Greenwood, F Whelan, Clarke (A Whelan 67), Williams, White, Scott, Walton, Turner, Crichton, Bassett. Substitutes not used: Chamberlain, Buet, Plumptre, Hassall, O'Neill. Substitutes not used: Sargeant, Wellings, Torkildsen, Peplow.